Starts from Nevsehir or Kayseri Airport. 3rd. Day - Breakfast at hotel. Transfer to the airport in Kayseri or Nevsehir and end of our service. 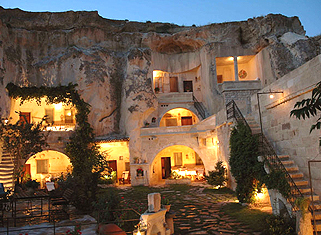 • Stay at the Dilek Kaya Hotel or similar (Cave Hotel - Superior Class Hotel) 2 nights. • Two way flight tickets from Istanbul to Nevsehir and return is NOT included. Flight Ticket Price is arround 70 - 80 Euro.- for 1 person and for 2 way. Flight Ticket Price can change according to season. • Drinks are extra in Lunch and Dinner. • Balloon Tour is extra. On our way to Cappadocia, we fly to Nevşehir or Kayseri. At 09.30-10.00 depending on the arrival time of the participants and visit to Devrent Valley to see the unique fairy-chimneys. We will walk through this amazing valley. Thereafter visit Pasabagi(Monk's Valley) with multiple stems and caps, peculiar to this area. After visiting Pasabagi, drive to Avanos which is known for the pottery, a craft dating river, the longest river of Turkey. First we visit to Rose Valley, one of the most beautiful trekking valleys in Cappadocia, and explore the famous rock-cut churces by hiking through the valley. Rest in Cavusin, an old Greek village, known for its Christian houses and churces. After having time for lunch visit Ortahisar Castle, similar to Uchisar Castle in style, where storage caves can also be observed. In the afternoon visit Kaymakli Underground City where early christians lived in fear and faith. On the way back visit to panaromic Pigion Valley where pigions contributed to lives of locals with their manure to fertilize the wineyard. You may also like to taste Cappadocia wine in a local winery. Optional Balloon Tour in the morning.